The Houston, Dallas and Austin locations of Centre Technologies held a Toy Drive for Texas Children’s Hospital in Houston, in association with the B.I.G. Love Cancer Care Services organization. In line with our mission to make a difference in the communities in which we work and live, the Toy Drive was planned to bring joy to children battling cancer, in honor of one-year-old Lincoln Davenport, son of Centre Technologies employee Ariel Davenport, who defeated cancer last year. Ariel and his family physically delivered all the gifts to the hospital on behalf of the company. Lincoln Davenport celebrated his first birthday. The celebration included cake, family, friends, and a pledge to support children with cancer and their families. Born to Centre Technologies’ employee Ariel Davenport and his wife, Kendall, in November of 2016, he was healthy and beautiful. Everything was going as expected…until it wasn’t. Facing every parent’s worst nightmare, Ariel and Kendall checked Lincoln into Texas Children’s Hospital, where they spent two weeks undergoing intensive diagnosis. Imaging revealed that tumors covered not just his adrenal glands, but were also attached to his liver. “In the midst of the scariest time our lives, we were beyond blessed by an organization called B.I.G. Love Cancer Care Services,” remembers Ariel. For the Davenport family, the greatest Christmas gift last year was Lincoln’s miracle diagnosis. The tumors were identified as Neuroblastoma 4S, a form of cancer that goes into remission on its own – no chemo or surgery required – if the patient is younger than 18 months old. Overjoyed by their miracle, the Davenports were able to bring their baby boy home from Texas Children’s Hospital on Christmas Eve, just in time to celebrate a very special holiday with their family. Over the past year, the Davenport’s have been taking Lincoln in for regular hospital visits – once a week at first, then once every three months. At their last visit, doctors could not locate the mass on the left adrenal gland and the mass on his right adrenal gland was 30 percent smaller than it had been at the previous visit. Of the many masses originally present on his liver, they could only find one. Throughout this terrifying ordeal, the Centre Technologies family stood by Ariel and his family. True to the Centre's vision of charity and community focus, Centre ensured that Ariel and his family had exactly what they needed every step of the way. “Centre was unbelievably good to us,” recalls Ariel. “No one asked about PTO or deadlines. One of my team members stopped by with a cash and gift cards collected from people at work – even from some I barely knew! After we got back, they organized meal deliveries to our house and provided a catered Christmas dinner." "We’re like a family. A lot of places say that, but it’s another to have meals sent to your house. They even provided us with a place to stay for two weeks when we couldn’t get back home after Hurricane Harvey." During their hospital stay, the Davenport family was blessed by the care and assistance provided by B.I.G. Love Cancer Care Services, a non-profit, volunteer-based organization committed to providing basic necessities and personalized care to children battling cancer and their families at Texas Children's Hospital in Houston and Dell Children's Medical Center in Austin. B.I.G. Love was established in honor of five-year-old Brooke Alyson Phillips. After fighting acute myeloid leukemia courageously for two years, through intense chemotherapy and a bone marrow transplant, Brooke passed away on September 29, 2006. Brooke's Incredible Gift (B.I.G.) is love. In her memory, B.I.G. Love maintains several toy chests at the TCH Cancer Clinic weekly and operates a weekly grocery program. According to Vicky Spengler, Volunteer Coordinator for Texas Children’s Hospital, the weekly grocery program provides all cancer kids and their families with an opportunity to request special grocery or comfort items that they might desire. This enables families to obtain essential groceries, supplies and other items without having to leave their child or their hospital room. But the goodwill doesn’t stop there. Ariel mentioned his son’s birthday party toy drive to his supervisor, Thomas Flores, and project coordinator, Joyce Johnson, and they wondered if Centre could take the project one step further. At the next management meeting, they approved the idea of a Centre Technologies company-wide toy drive to benefit Texas Children’s Hospital and B.I.G. Love—delivering the bundle of toys in July. We feel extremely blessed to share Lincoln’s progress, and his latest update with all you! This an exciting time for us Davenport’s, and all of those who love Lincoln, and have been believing for his miracle! The last 18 months have been full of answered prayers, that’s for sure. Lincoln started this whole journey with cancerous tumors on both, his right and left adrenal glands, and completely covering his little liver. I am so excited to tell you that we are now only waiting on ONE little spot to disappear! 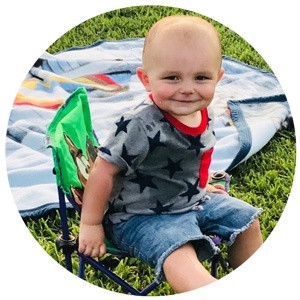 This last little tumor was the largest of all of the tumors, on his right adrenal gland, and has already decreased in size to less than a quarter of its original size. As of right now, we are just standing firm in the promise of Lincoln’s healing. Lincoln still remains non symptomatic. He absolutely loves trying to join in on the big brother wrestling matches, and quite honestly... he can hold his own for the most part! He is the happiest, sweetest, and most active 31 lb, giant of a one year old you’ve ever seen. We are overwhelmed by the pure goodness of “our people” and cannot wait to sometime soon get to update you all with the news that Lincoln is CANCER FREE! We just know it’ll be soon! Until then, thank you so very much for all of your continued prayers, all of the encouragement we’ve received, and certainly for your generosity to the beautiful kiddos and families that spend their days fighting this nasty thing called cancer. THANK YOU!!! Texas Children’s Hospital and B.I.G. Love Cancer Services accept donations at all times of the year. According to Vicki Spengler, there are a number of favorites that are always appreciated by the children and families in the Cancer Center at the hospital.